The country’s tallest man-made memorial and the site of several momentous court decisions make the Jefferson National Expansion Memorial a must-see destination for thrill seekers and history buffs alike. Bridging east and west, north and south, past and future, the Jefferson National Expansion Memorial celebrates America’s ongoing quest for freedom, adventure, and opportunity. 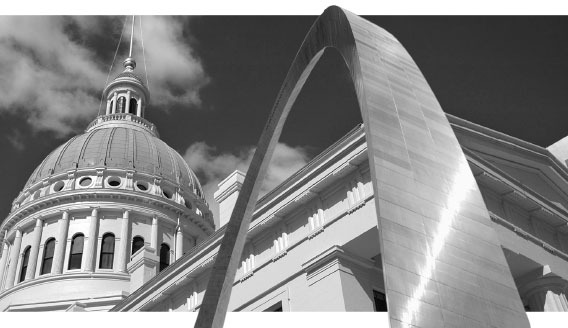 Strategically located near the confluence of the mighty Mississippi and Missouri Rivers, the city of St. Louis served as an important center for commerce, exploration, and military operations. And today’s Jefferson National Expansion Memorial represents the confluence of several diverse elements. Begun in 1839, the Courthouse is a prime example of mid-19th century civic architecture and is the oldest standing building in downtown St. Louis. Its long history includes a number of pivotal civil rights cases, most notably the Dred Scott decision. Brought to Missouri by the family that owned him, the enslaved Scott had been sold to an Army physician who took him to live in a territory where slavery was barred. In 1847 and 1850, under Missouri’s “once free, always free” doctrine, Scott sued for his freedom at the St. Louis Courthouse. In 1857, after years of complex litigation, the U.S. Supreme Court decided against Scott and his wife Harriet, ruling that African-Americans were not citizens and thus had no right to sue in court; further, that as slaves they were considered property and their owners’ property rights were protected under the Constitution. Dissent over the decision helped to speed the start of the U.S. Civil War four years later. In 1935, President Franklin D. Roosevelt issued an executive order designating property along the downtown St. Louis riverfront to be developed as the Jefferson National Expansion Memorial. While the land was cleared in preparation for construction, the City of St. Louis deeded the Old Courthouse to the National Park Service to be incorporated into the Memorial. In 1948, a nationwide design competition decided what shape the Memorial would take. 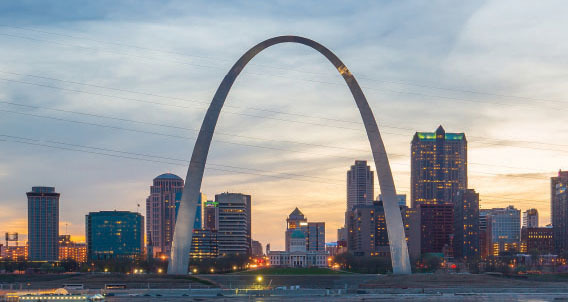 In 1963, construction began on architect Eero Saarinen’s inspired design for a 630-foot stainless steel arch honoring St. Louis’ role in the westward expansion of the United States. Completed in 1965, the Gateway Arch stands as a transcendent symbol of national identity and an iconic example of mid-20th century Modern design. Situated at the confluence of two great rivers and on the country’s western edge, St. Louis’ location made it the ideal starting point for early explorers, including Meriwether Lewis and William Clark, fur trappers, covered wagon pioneers, artists, and settlers to access the West. Although new museum exhibits are currently under construction beneath the Gateway Arch, the galleries in the Old Courthouse feature many of the most popular artifacts from the former Museum of Westward Expansion, and include three new exhibits: Early St. Louis, Exploring the West, and Clash of Cultures tracing the history of the plains Indian tribes. The Old Courthouse also boasts beautifully restored courtrooms available for visitors to tour and learn more about our country’s 19th century judicial system. Take the thrilling ride to the top of the Gateway Arch. And enjoy the view from 630-feet up at the top of this iconic architectural marvel, the tallest man-made monument in the United States. Ticket required. Visit the Old Courthouse galleries to tour fascinating exhibits tracing the history of western exploration, the City of St. Louis, and the lives of the plains Indians. Watch for the spectacular new museum exhibits coming soon to the Gateway Arch! Check out our progress here. Explore the history and significance of the Dred Scott and other landmark court cases on a ranger-led tour through the restored courtrooms of the Old Courthouse. Cruise the Mississippi River on replica 19th century steamboats that combine the charm of the 1800s with modern conveniences of today. The Gateway Arch Riverboats offer a variety of cruises, including sightseeing, dinner, and many specialty cruises. See how the magnificent Gateway Arch was designed and built in the film Monument to the Dream at the Tucker Theater located beneath the Gateway Arch. Showing daily in the Old Courthouse, Slavery on Trial: The Dred Scott Decision details the struggle for freedom of St. Louis slaves Dred and Harriet Scott and the infamous Supreme Court decision of 1857. From stargazing workshops at the Arch to an 1800s-inspired ball celebrating George Washington’s birthday, the Jefferson National Expansion Memorial offers a variety of events and ranger-led talks throughout the year. Check the calendar for details.